I was afraid the Wild Bird Fund people were going to tell me my bird was fine and I should have left him where he was so his mother could find him. That didn’t turn out to be the case. I’m not happy that he is not fine, but I did the right thing and he’s going to get great care now. He’s about 14 weeks old I learned, and the vet showed me the xrays where he has a broken leg AND a broken wing. Poor little guy. I could see she was debating what to do. I’d been told they’d splint him up and I’d have to take him home, but she ultimately said, “He needs to stay here. We can manage his pain and feed him, he needs about a week.” Then I have to take him home and get him ready to be released, except she said they may just turn him over to the group that does the re-homing, I’m supposed to call back in a week to find out. She said the wing was broken in a spot where he’d be able to fly again. I miss him already, and I may never see him again. This is Finney demonstrating why I never could have kept him anyway, it’s for the best. Thank you Wild Bird Fund for taking him and helping him. You do realize that Finney is watching a mourning dove and not a rock dove (aka pigeon)? 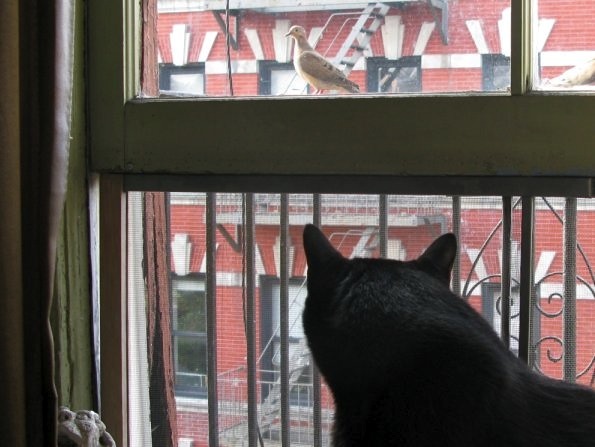 I didn’t think you got mourning doves there, but obviously (as displayed by your picture), I am wrong, wrong, wrong. Yes, that’s a dove and my bird was a pigeon. Thank you Nadine, I did!! Thank you for saving your pigeon. He was one lucky bird to have you near! The best people I know are from Animal Rescue groups. Your heart is as large as your talent. Aw, good on ya for rescuing that pigeon. I met a couple of really nice women on the train a few weeks ago who were taking a rescued grackle to be rehomed by the wild bird fund. They do such good work. Oh, how cool, what a coincidence! Yeah, they are a great group. I would be a wreck right now if it weren’t for them. I’d have this wounded bird without a clue as to how to help it. That would have killed me. Now I’m all happy knowing it’s being taken care of.